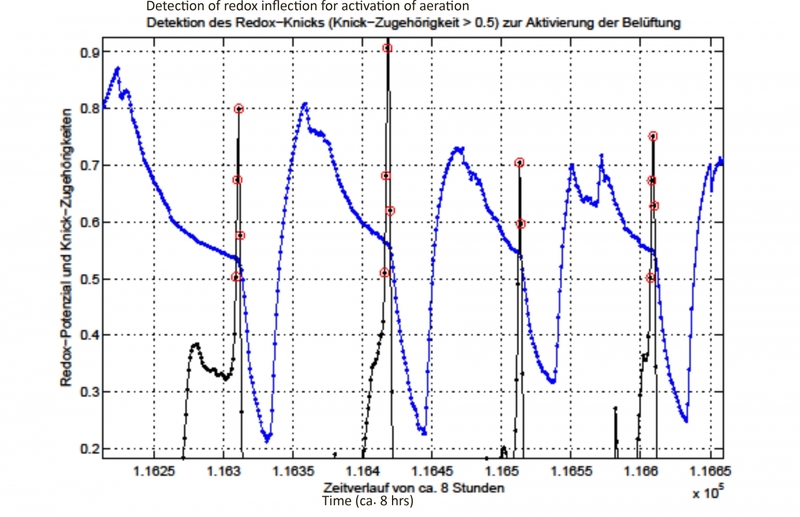 Because of the excellent sludge settling properties, S::Select® allows for very high sludge concentrations in the biological reactor basins. However, the aim should be to retain only as much activated sludge in the system as is necessary to safely maintain the required discharge values as well as the outstanding sludge settling properties. Is the SRT higher than necessary, then a portion of the aeration energy is merely wasted. At the same time, gas yields from digestion are lower because the sludge is being stabilized too much. Most of all, the risk of bulking sludge is being increased tremendously. S::Control® sets the SRT precisely so high as needed so that there is enough activated sludge to achieve the removal objectives, but no more. The energy balance is being optimized while safely complying with the required discharge values. The excellent sludge settling properties are being permanently maintained. The S::Select® effect becomes possible by encouraging bacteria to produce excess extracellular polymer (EPS). This is a prerequisite for the formation of sufficiently large and stable activated sluge floc. The production of EPS is triggered by exposing the biomass to recurring stress situations at short intervals. This leads directly to the production of EPS. The control of the process optimal SRT relies on the steepness of the pH drop during the aerated phase. The Δ pH is an ideal characteristic variable as it recognizes the performance of nitrification, regardless of sludge concentration, water temperature, load fluctuations, and so on. During the learning phase of the controller, the target Δ pH is adjusted to the desired NH4-concentration. 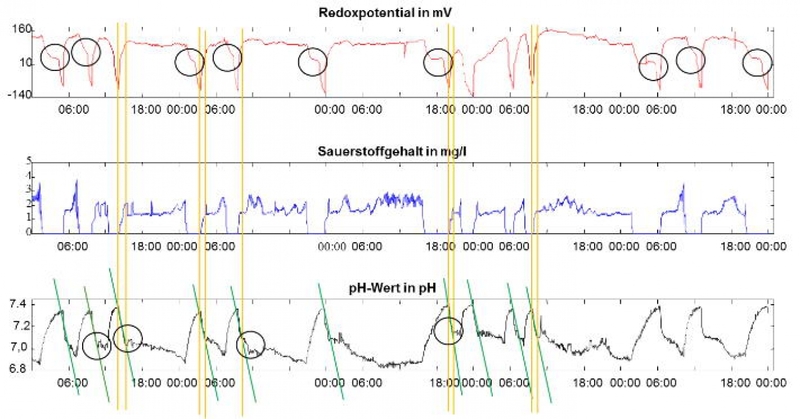 The sludge removal is then carried out on the basis of the currently measured Δ pH so that the target NH4-value is always safely but precisely maintained. The controller detects straight linear sections and calculates only from these the Δ pH. The quality of detection is evaluated with the affiliation. When affiliation is not sufficient, the steepness is not included in the evaluation. 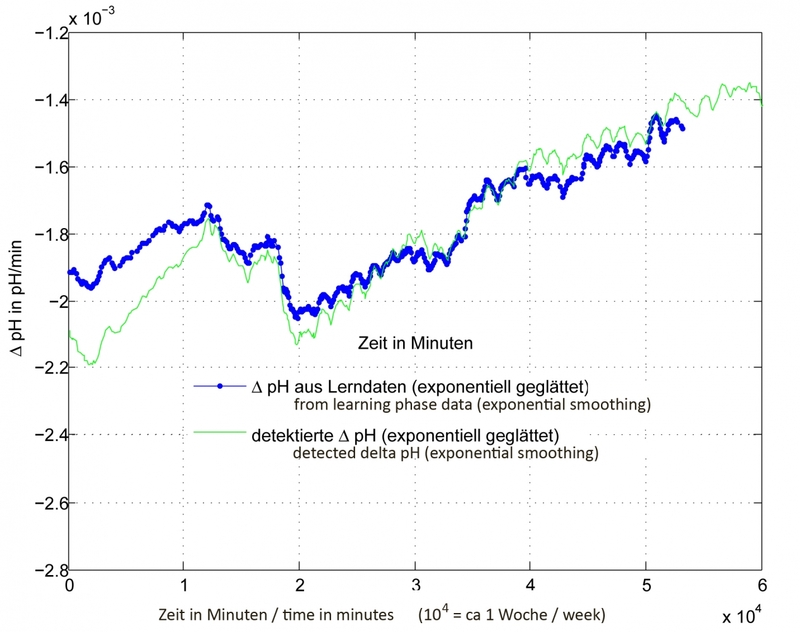 This graph shows exemplary the trajectory of the averaged Δ pH (exponential smoothing) over a period of 8 weeks. It is apparent how much this parameter is being influenced by the various influence variables, i.e. how tremendously important setting of the ideal SRT is. Unfortunately, this insight is being ignored by the majority of activated sludge plants. The trajectory of the pH in the aerated phase respectively the transition from the straight line into the saturation is a reliable indicator that NH4 is a significantly substrate limited factor, i.e. the NH4 concentration has reached very low values. Aeration is now switched off. The Redox inflection is a reliable indicator of the achievement of NOx = 0. When this pattern is being sufficiently and accurately detected, then it is interpreted as the end of the denitrification phase and aeration is switched on again. S::Control® is based on fuzzy pattern logic. Patterns are detected and compared with the current graph trajectory. Fuzzy pattern logic is a common statistical analysis tool (identification of a fingerprints is based for example on fuzzy pattern). 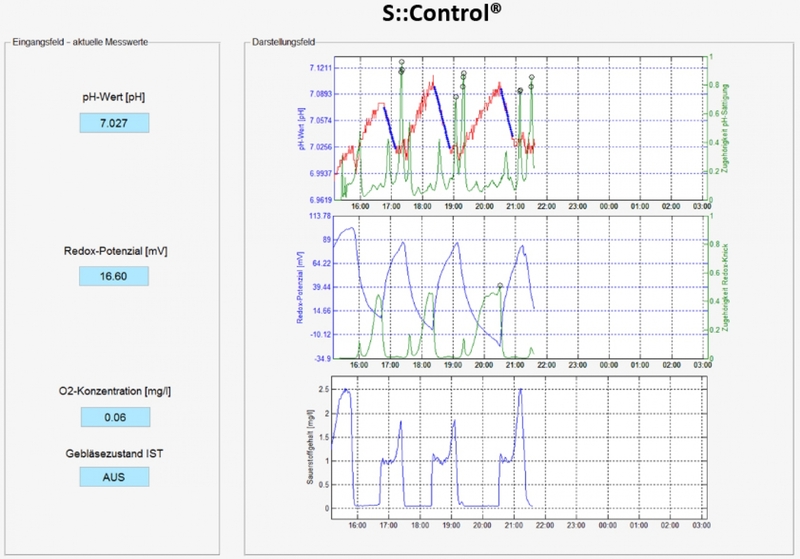 S::Control® requires only pH and redox potential. It is simple, robust and highly reliable once it has been properly trained and adapted. S::Control® is crucial for permanently maintaining excellent sludge settling properties. 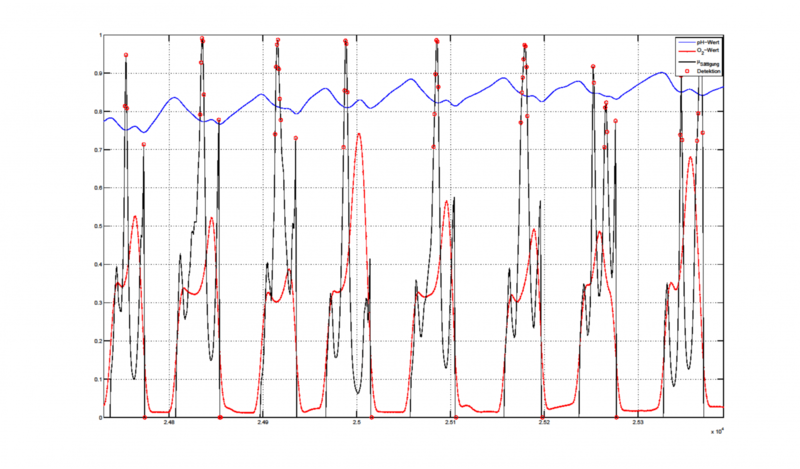 In light of energy balance, robustness, and excellent discharge values, S::Control® is the ideal addition to S::Select® in terms of energy balance, robustness, and achieving excellent effluent values.